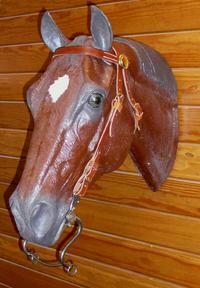 Most popular style of headstall because of its wide range of adjustment. Includes rosettes. Specify rosette style: US, USA, or Star. 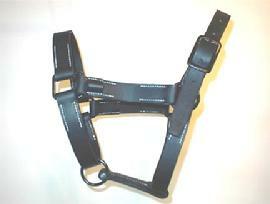 Black japanned roller buckles also available. As of 5/12/12 IN STOCK! 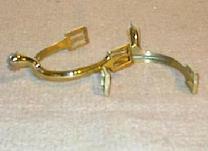 Features brass horseshoe type buckles and star rosettes. 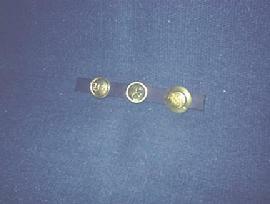 Features brass bar frame bar buckles with bulls-eye rosettes. Sold by the pair. Brass. Specify style. Sewn in the center. Made to be sewn onto bit rings. Sewn in center with buckles sewn on to easily attach to bit rings. Black or Russet leather available. 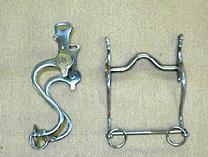 Black or Brass bar buckles, horseshoe, or roller buckles available. Polished steel finish. Us bit medallions. Made in the USA! Lifetime Guarantee!! Low, medium, or high port available. CS or Civilian style bit. Hand forged. Classic bit of the Indian Wars. Low, medium, and high ports available. Not Available at this time. Special order only if several pieces. US Regulation. Correct black japanned hardware. 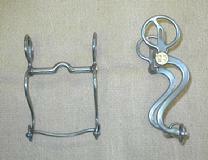 Loops for watering bridle. Black or russet leather available. Used to link horses halter to halter. Made with correct bar buckle and snap hook. Complete with connecting straps and seed stuffed tail dock. 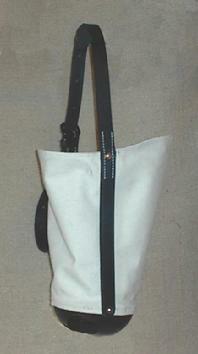 Heavy canvas with molded leather bottom and leather strap. This is a period reproduction. It does NOT have vent holes. An unattended horse that is allowed access to water can drown. A must for feeding on the picket line! 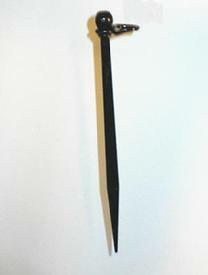 Civil War period steel picket pin with ring. 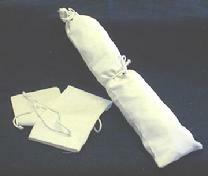 Designed to carry two days grain rations. Canvas construction with tie strings. 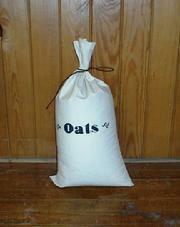 There's no need to hide those modern feed sacks anymore! Made to fit the above spurs. Black leather standard. Russet available.